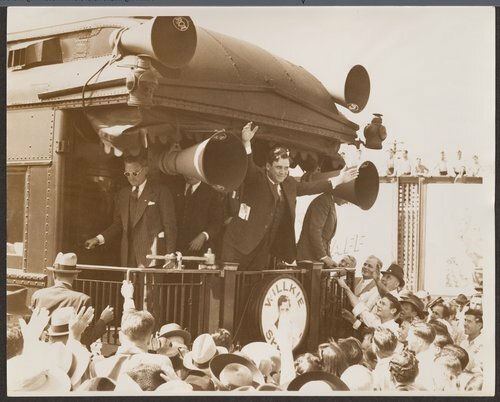 These five photographs show Wendell Willkie's campaigning for the U.S. Presidency, at the Missouri Pacific Railroad Station, in Pittsburg, Kansas. Willkie, the Republican nominee, chose the towns of Pittsburg and Coffeyville to kickoff his campaign because of prior connections to the area. He had once taught high school history in Coffeyville before becoming a corporate lawyer and political candidate. During his ten minute stop in Pittsburg, Willkie spoke to an estimated crowd of about 1,000 against the policies of the New Deal and his challenger President Franklin D. Roosevelt. Willkie was defeated by President Franklin D. Roosevelt in the November election.